Since the last set of reflector tests a few more new reflectors have been introduced in the market. These new reflectors all carry the “Lumen” name – Lumenbrite, Lumenmax Elite, Lumenmax, similar to their predecessor the Lumenarc III, even though they are manufactured and marketed by different companies. 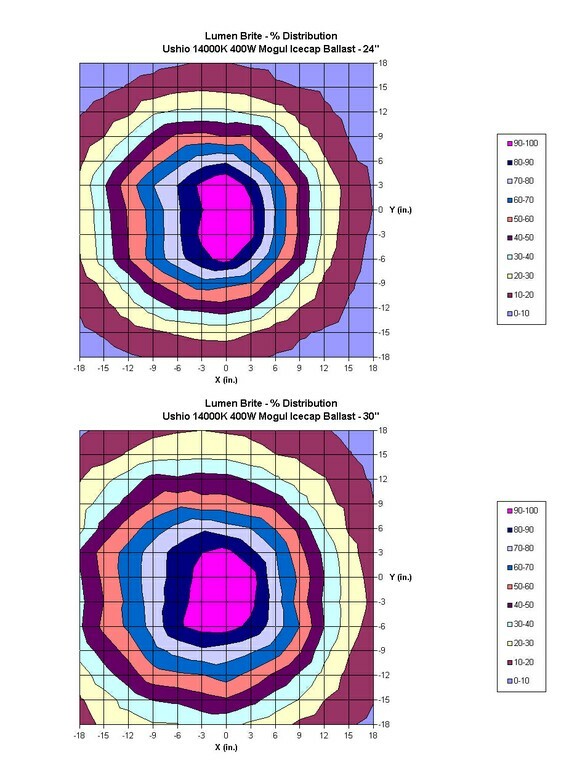 This article presents test results on these new fixtures/reflectors. The reflectors were tested using the same setup and methodology as used for the tests on other reflectors, described in . Previous reflector tests had data for light dispersions at 6″,9” and 12″. While this data allowed for a meaningful comparison between the reflectors, it could be argued these are not practical distances at which corals would be placed in the tank and data further from the lamp would be more useful. Further, there was speculation among hobbyists that some reflectors were better at projecting light further away from the reflector and hence making them more suitable for deeper tanks. To accommodate some of these concerns, measurements in this study have been made at 24″ and 30′ from the center of the lamp in the reflector. This article continues in a similar vein as the previous reflector articles and presents the data and analysis of these new reflectors in my inventory, and compares them to the Lumenarc III reflector. Table 1, presents the information on the ballasts and lamp used to test all the reflectors. Since the same ballast and lamp is used, direct comparisons can be made between the reflectors. Table 2 lists the physical specifications of the reflectors, manufacturer, pictures and some comments on these reflectors. 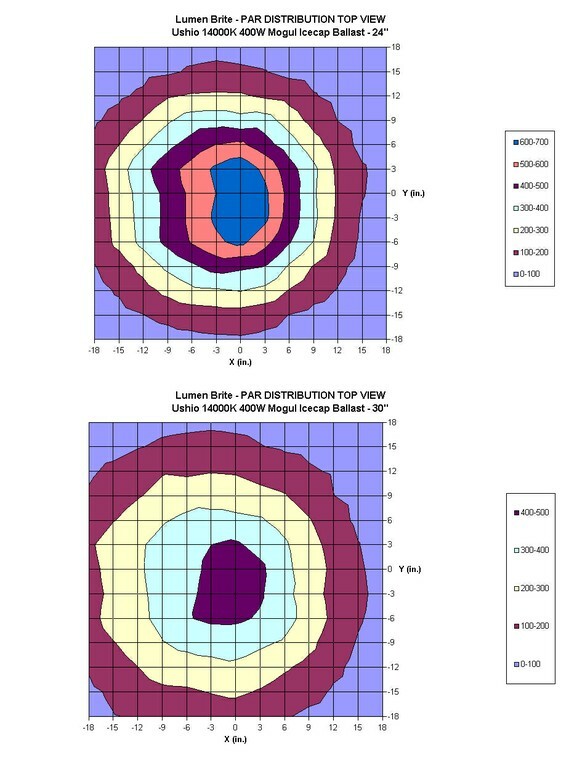 The data plots for each reflector at the distances 24″ and 30″ are plotted as a surface graph, top view graph, and a % distribution graph to illustrate the intensity and spread at different points on the 36″X36″ measuring grid, with data recorded at 3″ intervals. 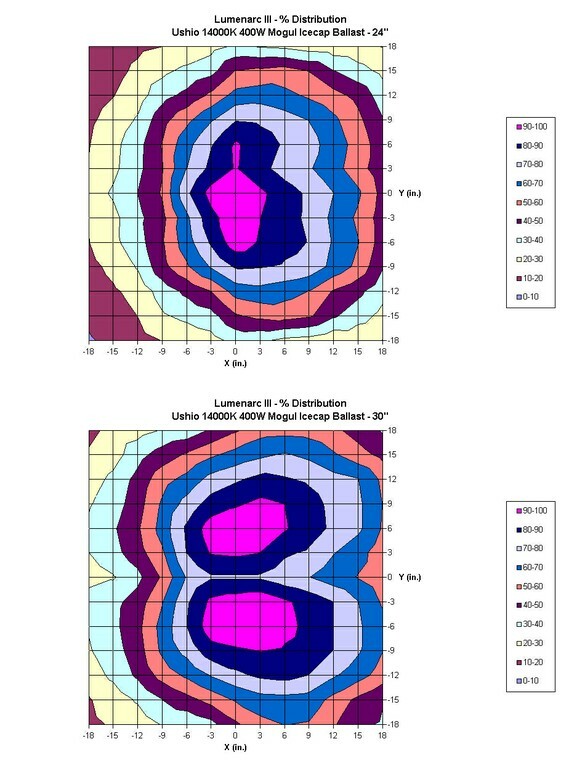 The lamps are oriented so that they are parallel to the X-axis in the plots, with the center of the lamp aligned with (0,0). All measurements of distances are taken from the centerline of the lamp. Table 3 below shows the list of figures associated with each reflector. Table 4 presents this data for the reflectors in this article. 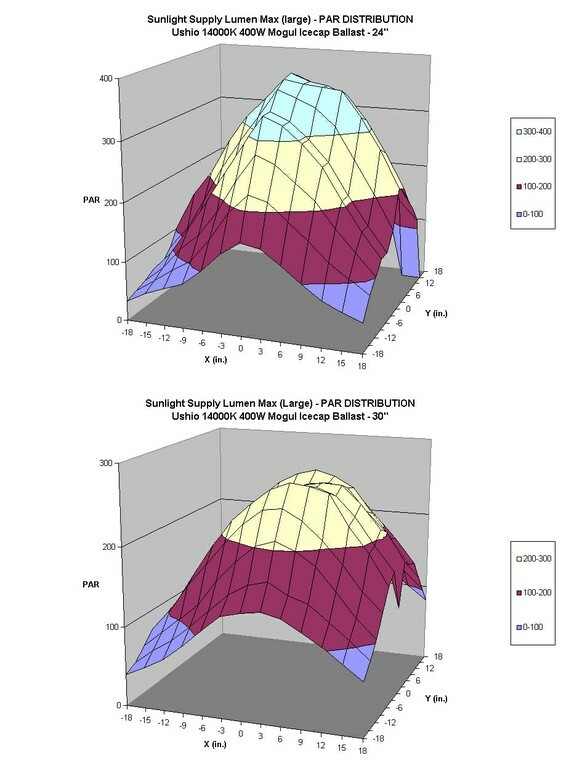 Note that the initial PPFD values of the lamp/ballast combo used to test the reflector influences this data. For these tests, the Ushio 14000K 400W lamp used with the Icecap Electronic ballast has a PPFD reading of 151.7 at 18″. 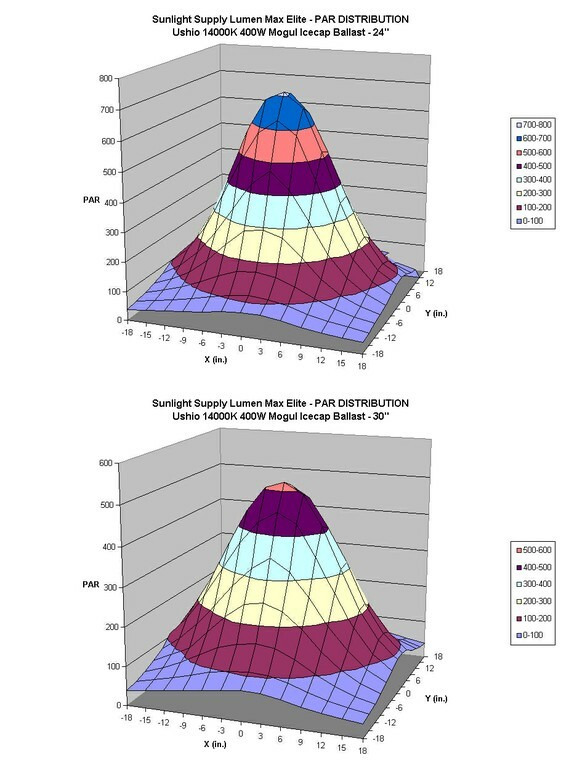 For any other ballast/lamp combo the PPFD data at 18″ can be obtained from the website http://reeflightinginfo.arvixe.com and the reflector data can be scaled appropriately. 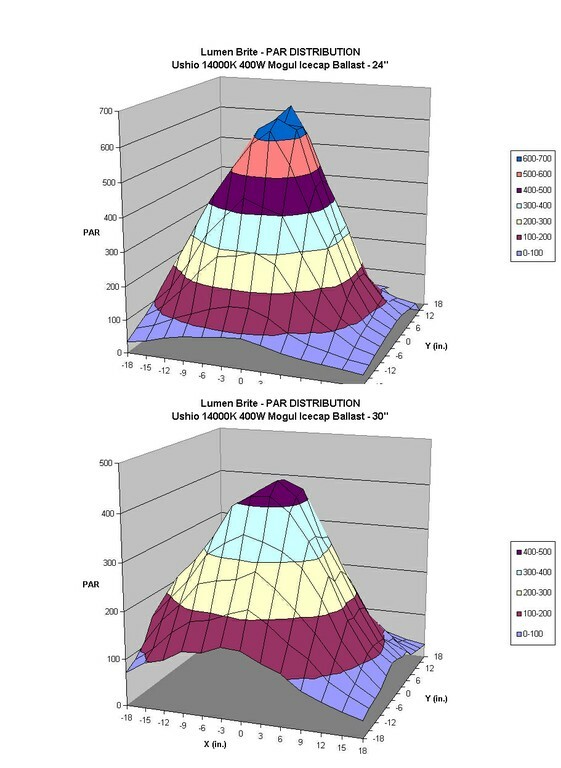 For example, if using a magnetic ballast with Ushio Blue 20000K lamp with a PPFD of 109 (from the data on the website), the reflector data can be scaled by 0.718 (109/151.7) to get a sense of the light values obtained with this combination. 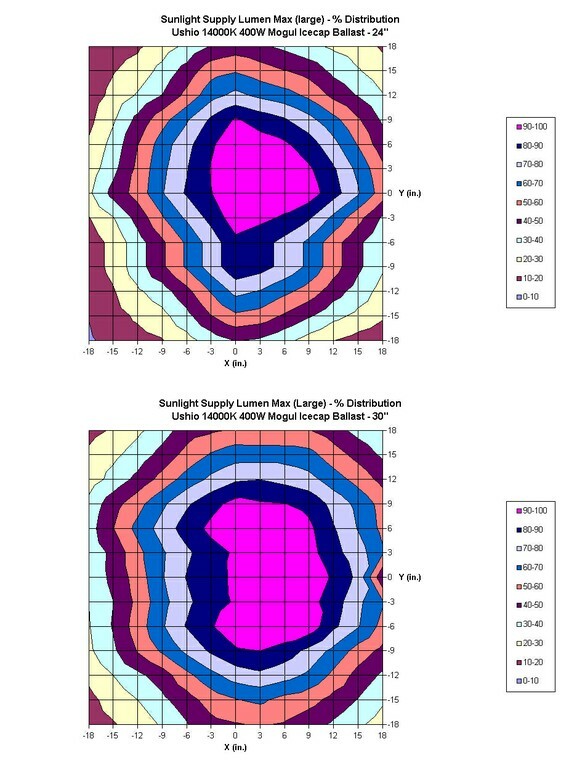 In addition to knowing how much light is incident on a given area, we could also look at how much loss of light occurs on a given area when moving the lamp and reflector higher. Table 5, presents the % of light lost on a specified area as one moves the lamp/reflector from 24″ to 30″ above the surface. A higher % loss would indicate that the reflector is creating a larger spread with an increase in distance. Reflectors are typically designed taking into account 2 conflicting design criteria – focus and spread. 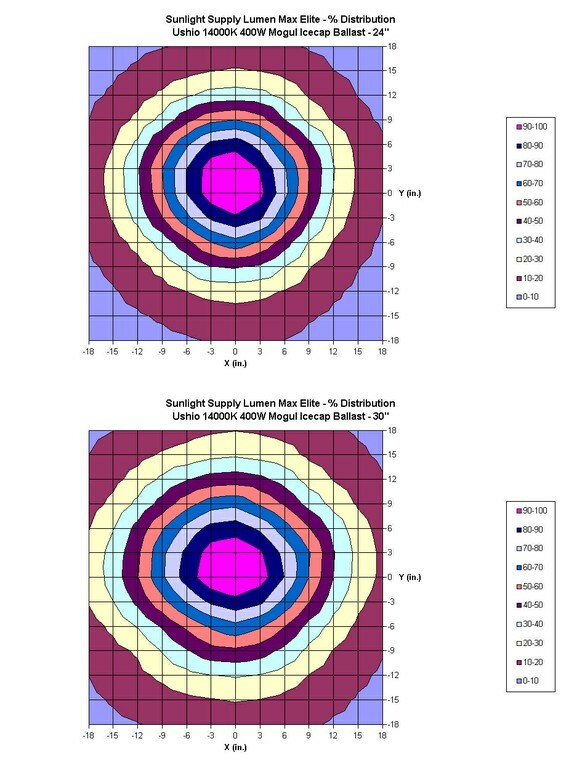 Given that a lamp is only emanating light at a certain fixed rate, the light from the lamp is gathered by the reflector and can either be focused to give a higher intensity over an area or spread out to give a large coverage albeit at lower light intensity. Light levels at any given point can also be influenced by changing the distance from the light source by raising or lowering the reflector. So saying one reflector is better than the other is not a trivial task and may even be meaningless, without taking into account the need of the user and the designer’s intent along with the physical constraints of the application. Choosing a reflector often requires taking into considerations the tank dimensions, aquascaping within the tank, the type of corals in the tank and their light requirements, cost budget, space available for mounting, etc. The reflectors seem to fall into 2 separate groups, Group 1, the Lumenarc and the Lumenmax and Group 2 comprising Lumen Brite and Lumenmax Elite. The Group 1 reflectors seem to be better at providing a wider coverage, whereas the group 2 reflectors tend to focus the light slightly more creating higher peak values and smaller spread. 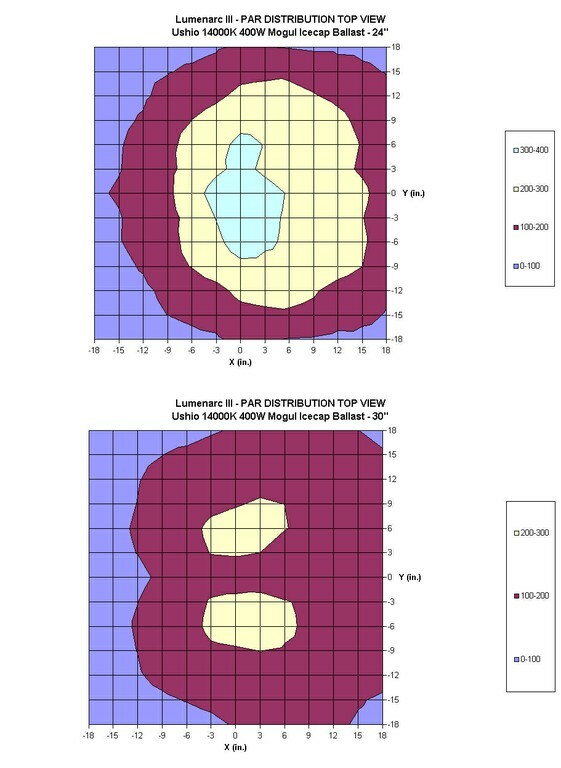 The lumenarc III and the Lumenmax reflectors provide a large area of light coverage and hence are more suitable for tanks wider than 3 ft. At similar distances they both provide a large coverage of area where the PPFD values reach between 100-200 micromoles/m2/sec. In my experience, if a user can achieve PPFD values of 75-100 at the bottom of the tank, then they will have enough gradation of light in the tank to find places to keep most photosynthetic corals happy in the tank. 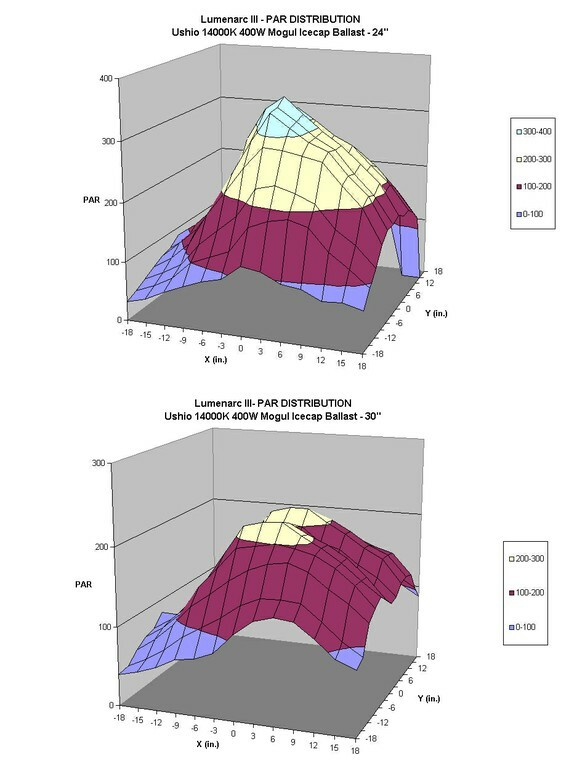 The Lumenmax reflector at 30″ provided a larger area where the PPFD values were greater than 200, as compared to the Lumenarc reflector. Hence, the reflector will be able to provide a higher intensity deeper in the tank, thus making it a better choice for someone looking to light a wide tank that is deeper than 30″, or for providing the ability to grow higher light corals lower in the tank. The Lumenbrite and Lumenmax elite are more suitable for tanks 3ft or less in width. 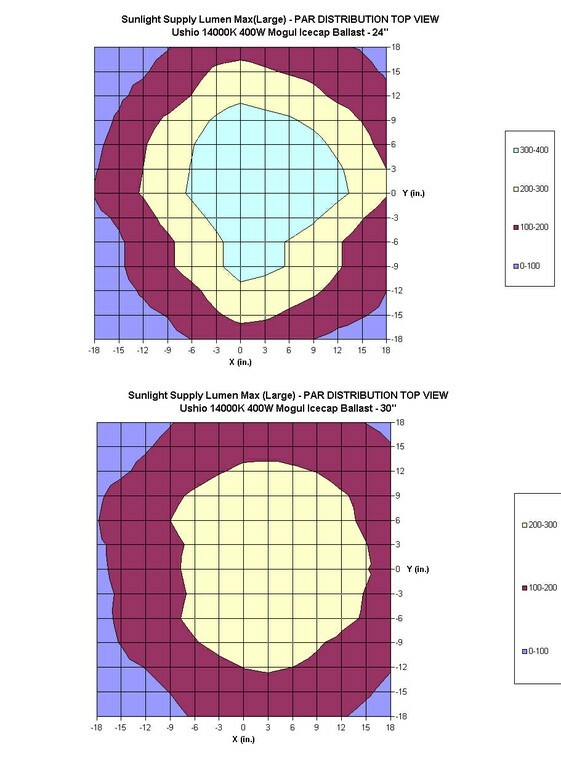 They tend to provide a more focused coverage and higher peak values than the Lumenmax and Lumenarc reflectors. This can allow for better use in taller tanks, as more light can reach the bottom, or allow for higher placement of the lights thus reducing the heat dissipating in the water, or allow for higher light values to be obtained lower in the tank. This would allow the user to create a reef with a much lower rock profile. On shallower tanks 24″ or less these reflectors would easily allow the user to move from a 400W lamp to a 250W lamp, resulting in savings in electrical costs. Reflector design for reef aquariums has improved considerably allowing for more efficient use of light. With these reflectors we can now light reef aquarium with fewer lamps, get deeper light penetration over larger areas. As an example, I am currently lighting my 500G reef aquarium (84″LX48″WX30″D) with just 3 400W metal halide lamps in Lumenarc reflectors with no supplemental lighting. All of these reflectors help shatter the age old paradigm of having one metal halide lamp for every 2 sq feet of surface area. At the time my aquarium was set up, there was no other choice for reflectors. The new reflectors Lumenmax, Lumenmax Elite, and Lumenbrite have added to the choices available. 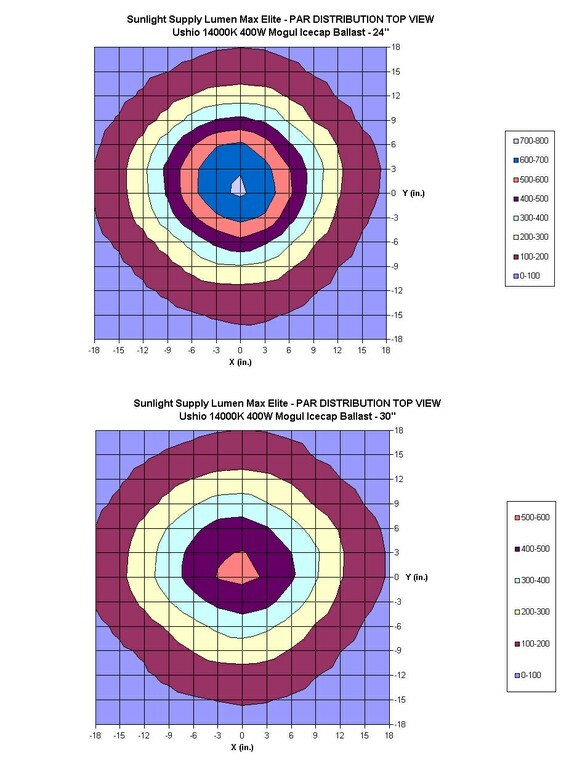 They are all excellent choices, given that these reflectors are fairly close in performance to each other within their designed scope the selection would have to come down to other factors as well – such as construction quality, size constraints, space available for mounting, aesthetics, cost and availability. It is my hope, that the readers would use the data to choose the reflector that best suits their needs, rather than to promote reflector A as being better than reflector B.
I would like to thank several people whose help made this study possible. They were kind enough to provide us with lamps, reflectors and ballasts for testing: Ushio Lighting, Icecap, Sunlight Supply, Pacific Garden Supply, and Reef Exotics.